Axiomtek announced the MANO120 mini-ITX motherboard featuring an AMD G-Series APU dual core T56N with AMD A55E FCH which supports dual video output (dual views) via VGA, HDMI and LVDS interface. The board can support up to 4 GB of DDR3 1333 memory, up to 5 SATA hard drives and a CFast slot. The MANO120 also comes with one PCIe x4 slot and one PCI Express Mini Card slot. 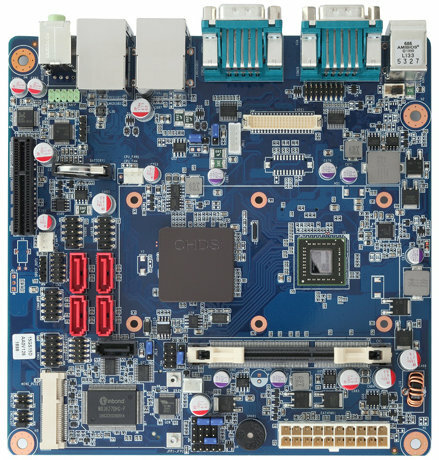 The company says the MANO120 industrial grade motherboard is ideal for digital signage, DVR (Digital Video Recording), and NVR (Network Video Recorder) applications. Here are Axiomtek MANO120 mini-ITX board specifications. Watchdog Timer – 255 levels, 1~255 sec. Power Requirements: +3.3V @ 0.47A, +5V @ 1.66A, +12V @ 1.07A, -12V @ 0.05A, 5Vsb @ 0.16A. Size – 170 x 170. The MANO120 Mini ITX motherboard will be available around the end of April 2012 at an undisclosed price. You can visit Axiomtek MANO120 page for further information.